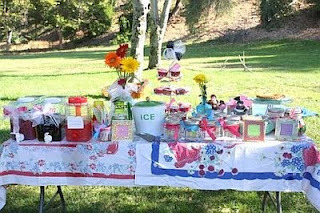 For today's sneak peak we have a collection of picnic items -- picnic baskets, blankets, tablecloths, a vintage enamel coffee pot, milk glass vases, strawberry print metal trays, mason jars and colorful plastic dinnerware. There are two or three of each item in the picture but we have much more of everything in our inventory. This collection is so fun... so many possibilities! 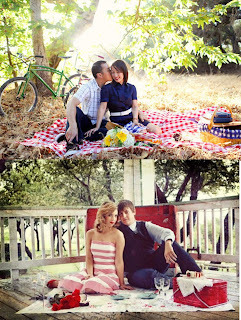 I've seen some really cute engagement photos staged with picnic items. I love these two in particular -- and you already know we have the perfect bike for rent to throw into the mix! 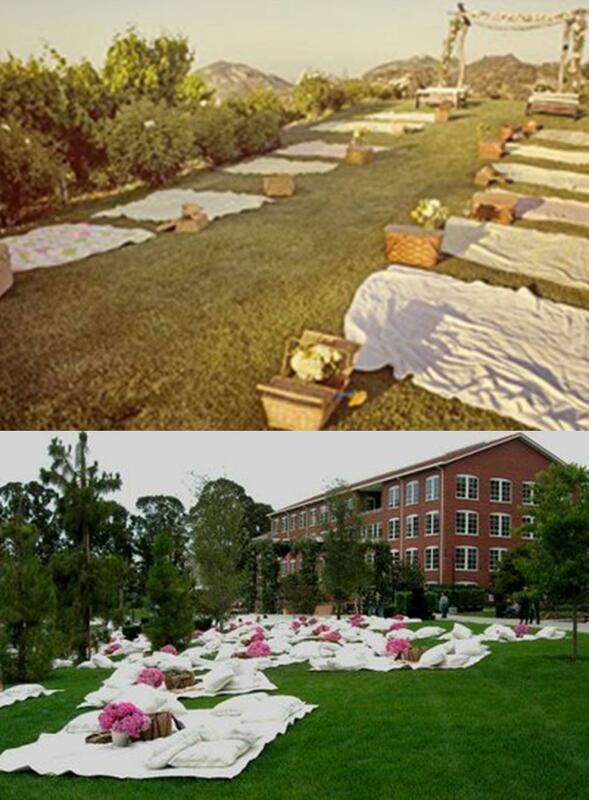 Imagine a picnic themed wedding! You could go with the checkered blanket/country retro chic look like in the engagement pictures above, or you could go more romantic like in the photos below. 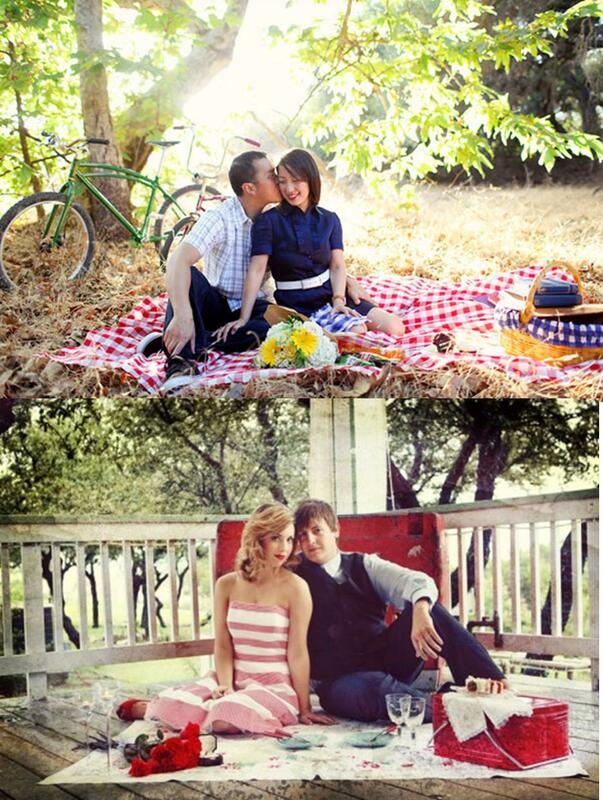 I am in awe of the picnic themed ceremony (below top picture). 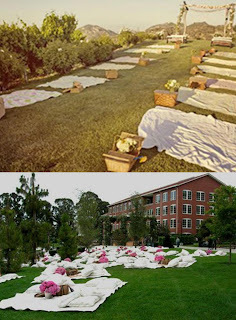 I love the idea of using blankets for guests to sit on and decorating the "aisle" with picnic baskets topped with flowers. You could always throw in a few vintage chairs for guests who might have trouble making it up and down from the ground. Or maybe add a couple of church pews (we have those, too) at the front for parents and grandparents of the couple, etc. 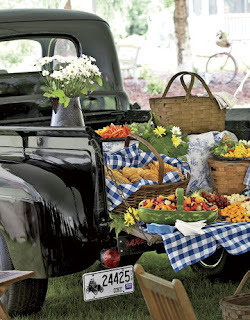 Setting up the buffet or some other type of display in the bed of a vintage truck is a great idea. We have a truck like this available, but it is a lot more rustic looking. And it definitely won't run. These little accents are sooooo adorable. 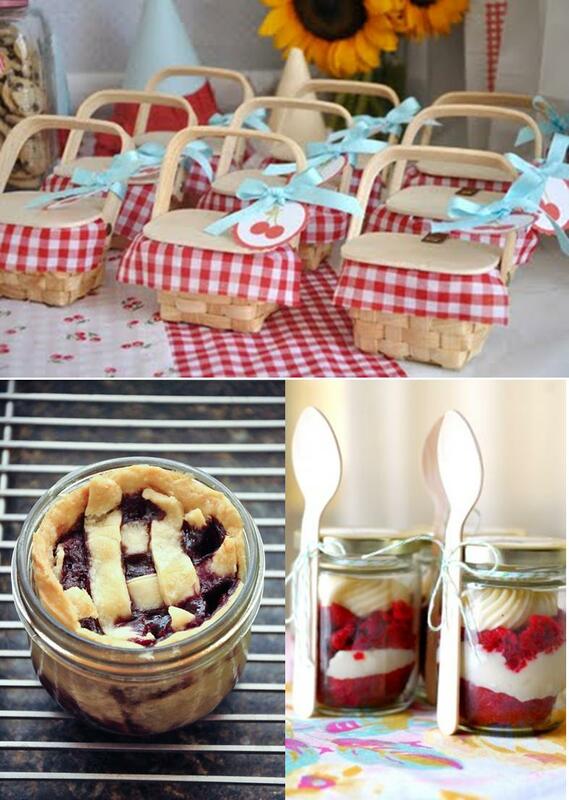 We have a large quantity of quart-sized wooden berry boxes that would have a similar look to the mini picnic baskets. 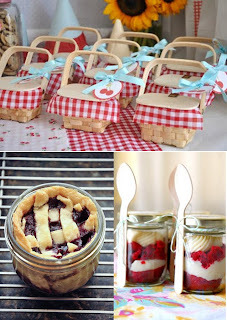 I've always wanted to try making a dessert in a jar. Fantastic presentation! We have loads and loads on mason jars on hand -- both for purchase and for rent -- if you would like to give this a try for your event. I don't know about you, but I suddenly have a craving for some strawberry shortcake. I think a trip to the strawberry farm might be in my future.